01. In 1970, Americans spent on this meal $ 6 billion a year in 2001 - more than 110 billion is larger than for higher education, computers, cars. More than books, movies, magazines, newspapers, videos and music - together. 02. 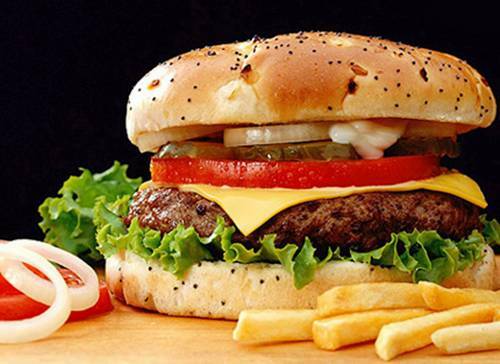 The average American eats three hamburgers and four servings of potatoes every week. 04. 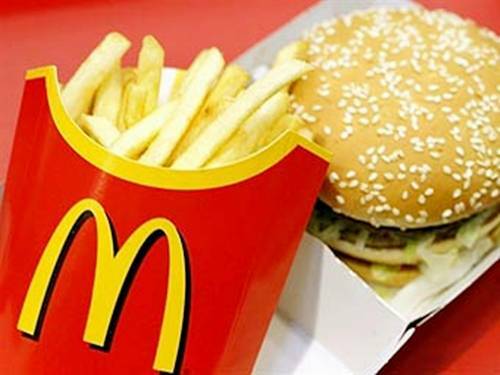 "McDonald's" consumption of pork, beef and potatoes, more than anyone else in the U.S., chicken - a little less than fast food "Kentucky Chicken frayed." 05. Especially for the "McDonald's" breed of chickens bred with huge breasts, "Mr. MD." Of white breast meat is a popular dish on the menu, "Chicken McNuggets." It changed the whole industry production of chicken meat. The chicken was sold not as a whole as 20 years ago, and cut into pieces. 06. Golden arches "of McDonald's," according to psychologist Louis Cheskin - Freudian symbol. It is "a huge pair of breasts," McDonald's mother. 07. 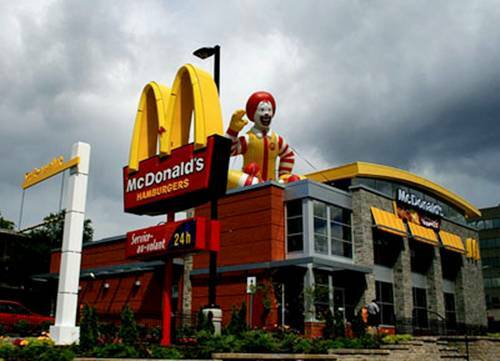 Two-thirds of all employees of fast food chains do not have 20 years. They work in a very small salary, performing simple operations. 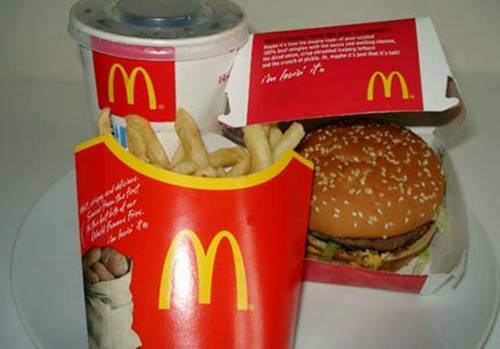 In 1958, the "McDonald's" had the first 75 pages of instructions, describing in detail the procedure for all the actions of cooking and ways of communicating with customers. Today, in this book, 750 pages, and it is called the "bible of McDonald's." 08. Staff turnover in the fast food - up to 400%. A typical worker goes from the cafe after 4 months. Among the employees a lot of teenagers from poor families and immigrants, especially from Latin America, who know in English only the name of dishes on the menu. 0. Low salary and lack of labor protection is replaced by the creation of "Team spirit" of the young workers. For a long time managers "McDonald's" learn how to properly praise subordinates and create the illusion of indispensability. It's cheaper than raise wages. 10.Injuries among the younger staff at two times higher than in adults. Each year, crippled in their cafes 200,000 people. 11. A young slave labor loves to joke. Videos in fast food in Los Angeles have shown that teenagers sneeze into the food, lick your fingers, pick their nose, put out cigarettes on the products, drop them on the floor. In May 2000, three teenagers from the "Burger King" in New York were arrested for being about 8 months of spit and urinated in the food. In mixers live cockroaches, and mice swarm at night left to defrost hamburger ... 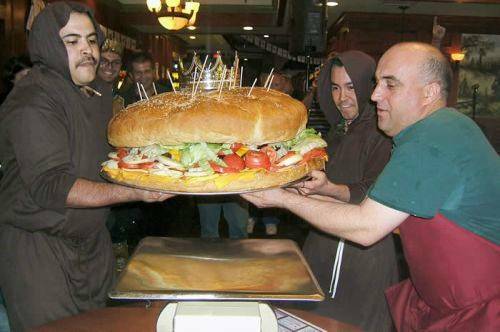 It is known that many workers do not eat fast food cafe in his home until it is cooked for a portion. 12. Taste the potatoes from the "McDonald's" everybody likes. Previously, he depended entirely on the fat in which it is roasted. For decades it was a mixture of 7 percent cottonseed oil and 93 percent beef tallow. In 1990, the people turned against cholesterol, fast food and switched to 100% vegetable oil. But the taste, it was required to leave the same! 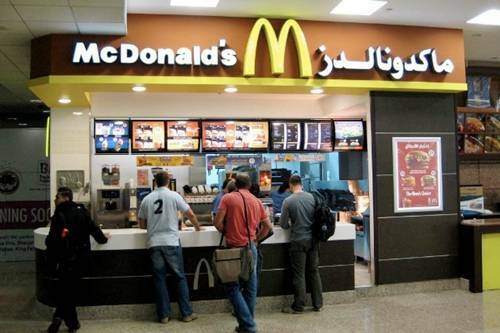 Today, if you ask for the "McDonald's" information on the composition of dishes at the end of a long list of modest look "natural flavoring". This is a universal explanation for why everything is so tasty fast food. 13. Recipes potatoes and hamburgers can not be found in cookbooks and in the writings of "Food Technology" and "engineering of food." What we eat there, over the past 40 years has changed more than in the previous 40 000. And the taste, and smell of hamburgers and the like is done in huge chemical plants in New Jersey. 14. About 90% of all the products we buy, have been pre-processing. Conservation and frost kill the natural flavor of food. 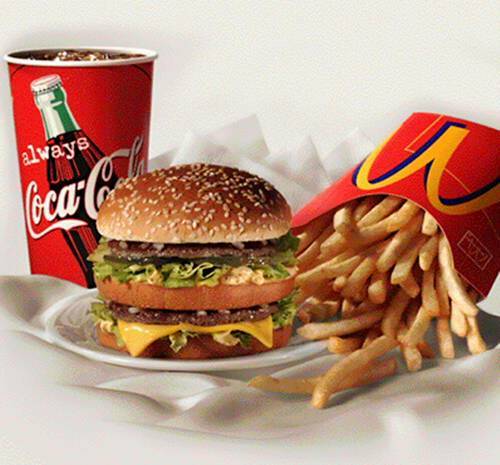 For the past 50 years, neither we nor the fast food could not survive without chemical plants. 15. In addition to the taste of products for "McDonald's" company "International flavors Fragransez End" makes the smell of six of the 10 most popular spirits of the world, including "Beautiful," "Estee Lauder" and "Tresor" "Lankoma." Also smells of soap, dishwashing detergents, shampoos, etc. All of this is the result of a process. Shave you're actually the same as you have for dinner. 16. Work at the factory has become the most dangerous in America, only the official figure is 40,000 injuries per year. U.S. meat plants process up to 400 carcasses per hour, whereas in Europe more than 100. Because of the low wages here are working alone immigrants. 17. Cows fed the farmers how they should be, with grass. Cows are designed for large fastfudovskoy grinder, three months before the killing of huge herds are driven to a special area where they are fed grain and anabolics. 18.. One cow can eat more than 3000 pounds of grain and 400 pounds of weight gain. The meat in this case becomes very fat, just right for stuffing. 19. The increase in grain prices has worsened an already dire situation. Prior to 1997 - the first call of mad cow disease - 75% of U.S. cattle ate the remains of sheep, cows and even dogs and cats from animal shelters. During a 1994 U.S. cows have eaten three million pounds of chicken manure. After 1997, the diet supplements were from pigs, horses and chickens, along with sawdust from the chicken coops. 20. Obesity - the second leading cause of death after smoking in the United States. Every year on his 28 000 people die. 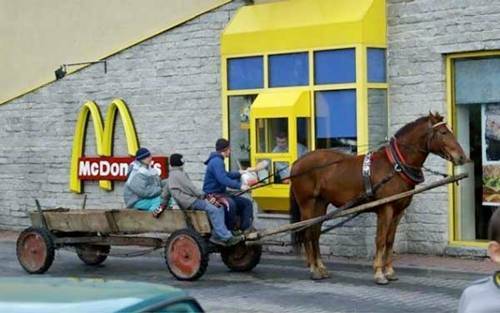 2 times increased levels of obesity in England, which most Europeans love fast food. In Japan, with its marine and vegetable fat diet had almost no - they have now become like everyone else.